Spring. It's all about new beginnings, from warmer weather to spring cleaning whether it be our homes, wardrobes or, in some cases, entire lives (what better time to make a big change than when the days are warmer, longer & all around better??). Another one of my favorite things about spring? Seeing some of my favorite companies roll out their latest & greatest. And, okay, maybe I use this as an excuse to do a little shopping, but I did just clean out half my closet this weekend. Pickwick & Weller released their spring line earlier this week and I'm more than a little excited about it. 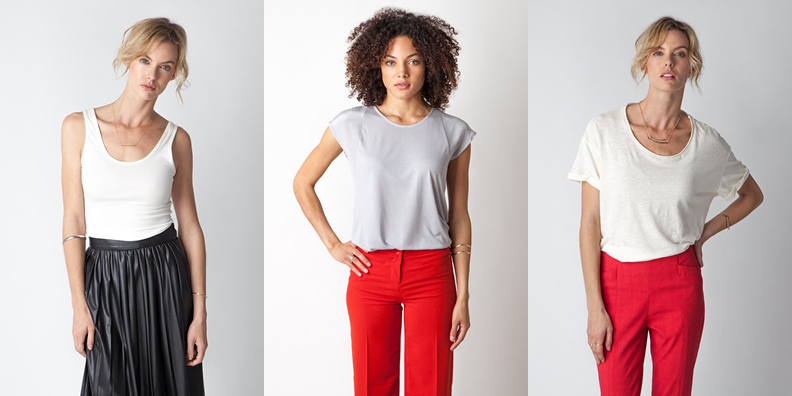 Not only was the company co-founded by (considerably more famous than myself) fellow Iowan Ashton Kutcher, but each tee is made here in the United States from a variety of fabrics including silk, cotton and linen. They design with the creative professional in mind, but worry not-their tees are great no matter what field you work in. Brighter colors and a larger variety of styles are included in their spring offerings-a few of which you can see below. If you've been with me for a while, you know I think a girl can never have too many t-shirts (evidenced here, here, here, here oh-and here). Owning a great tee is like having the right foundation-literally and figuratively-it can anchor a wild printed pant, layer neatly under an architectural blazer or let a statement necklace sparkle. Bonus? Unlike a beaded silk top, you can keep it on after you get home & change into your PJ's (guilty, all the time). Ready to shop Pickwick & Weller? Visit the spring collection here (shopping for a guy in your life? They've got you covered there, too). On the fence? Don't worry, they'll send you a free fit kit based on your style. Want to learn more? Check out this short video (if it doesn't work below, you can click here to view its original format). *compensation was not provided by Pickwick & Weller. I just really, really love a good t-shirt.